In practical situation sometimes it becomes difficult to work with a long measuring tool. Therefore alongside the full-length questionnaires some shorter even abbreviated questionnaires were developed. Eysenck, Eysenck and Barrett devised a short-form of the revised Eysenck personality questionnaire (EPQR-S) for adults containing 12 items in each dimension of extraversion, neuroticism, psychoticism, and lie scale. Corulla developed the short-form of the revised junior Eysenck personality questionnaire (JEPQR-S) containing 48 items. Francis developed an abbreviated-form of the junior Eysenck personality questionnaire (JEPQR-A) containing 24 items from the JEPQR-S. He recorded alpha coefficients for different dimensions of the JEPQR-S; extraversion 0.7657, neuroticism 0.7895, psychoticism 0.7124 and lie scale 0.6810 but for the reduced 24 items JEPQR-A, the respective alpha coefficients were reduced to 0.6644 for extraversion, 0.7027 for neuroticism, 0.6112 for psychoticism and 0.5747 for lie scale and this was because of the shorter length of the questionnaire. The Eysenck personality questionnaires were originally developed in England and then extended to other English-speaking areas with different culture. Cross-culture studies among some English-speaking countries were made by Francis, Brown, and Philipchalk. More recently different forms of Eysenck personality questionnaire were translated in different languages and consistency of the translated questionnaires were examined. Francis, Lewis, and Ziebertz translated the EPQR-S into German and applied over a sample of 331 students. Reported alpha coefficients for the four scales were extraversion - 0.8523, neuroticism - 0.8104, psychoticism - 0.4181, and lie scale - 0.6379. Tiwari, Singh, and Singh translated the same questionnaire (EPQR-S) into Hindi and applied over a sample of 202 Hindi speaking students studying in the Banaras Hindu University. Reported alpha reliabilities for the four subscales were extraversion - 0.766, neuroticism - 0.772, psychoticism - 0.238, and lie scale - 0.624. Because of the importance of the personality measuring tools in research work and educational purpose, present study was aimed to examine the psychometric properties of the Bengali translation of the JEPQR-S developed by Corulla  for Bengali speaking school students. A total of 226 Bengali medium students (male 99 and female 127), studying in class seven and eight, were taken from two urban and two rural schools of West Bengal. JEPQR-S developed by Corulla is 48 item self-reported questionnaire having four dimensions extraversion, neuroticism, psychoticism, and lie scale each of which has 12 items. Each question has a binary response and scored either 1 or 0. The maximum possible score of a dimension is 12 and the minimum is 0. The items of the questionnaire were translated into Bengali by two bilingual Bengali personnel. Where there were inconsistencies, both the translators were consulted. Also back translation of the questionnaire by an expert was made and where there were any inconsistencies, the translators were consulted to get best possible solutions. Internal consistency of each items of each of the four subscales of the translated JEPQR-S was completed. The internal consistency of the four subscales of the translated questionnaire was also calculated. Test-retest reliability was found with an interval of 3 months. Inter-correlations between different subscales were also found. To find internal consistency of items under a subscale, item rest of test correlations were found. The internal consistency of the subscales of the translated questionnaire was found by calculating Chronbach's alpha. The statistical analysis was made with the help of Statistical Package for the Social Science (SPSS) statistics 17.0. [Table 1] presents that the item rest of test correlations vary for the extraversion between 0.082 and 0.417, for neuroticism between 0.127 and 0.552, for psychoticism between 0.085 and 0.504, and for the lie scale between 0.051 and 0.363. Alpha reliability found for the four subscales were 0.620 for extraversion, 0.663 for neuroticism, 0.604 for psychoticism, and 0.620 for lie scale. The test-retest reliabilities were found 0.659 for extraversion, 0.652 for neuroticism, 0.631 for psychoticism, and 0.621 for lie scale. [Table 2] presents the correlation coefficients between the four subscales. Results relating to the main stream questionnaires provide that the dimensions of personality are not all orthogonal. , The inter correlations [Table 2] between the dimensions of the translated JEPQR-S of the present study also show that they are not all orthogonal. There is a significant (0.05 level) negative correlation between extraversion and psychoticism. Neuroticism and lie scale also showed negative correlation significant at the 0.05 level. On the other hand, extraversion and lie scale also neuroticism and psychoticism both showed positive correlations significant at the 0.05 level. However, there is a significant negative correlation at the 0.01 level between psychoticism and lie scale while extraversion is independent of neuroticism. On the basis of the present study, it may be concluded that the Bengali version of the JEPQR-S may be accepted as a functional tool for research work and educational purpose. It is further recommended to administer the Bengali version of JEPQR-S on a larger sample for determining the psychometric properties more accurately. Author of this paper is grateful to respected Dr. A. Sensarma, Shiksha-Satra, Visva-Bharati and Dr. S. K. Samanta, Prof.-in-charge, Centre for Mathematics Education, Visva-Bharati for their kind help to prepare this paper. 1. Eysenck HJ. The Scientific Study of Personality. London: Routledge and Kegan Paul; 1952. 2. Eysenck HJ. Manual of the Maudsley Personality Inventory. London: University of London Press; 1959. 3. Eysenck HJ, Eysenck SB. Manual of the Eysenck Personality Inventory. London: University of London Press; 1964. 4. Eysenck HJ, Eysenck SB. Manual: Eysenck Personality Questionnaire (Junior and Adult). San Diego: EdITS; 1975. 5. Eysenck SB, Eysenck HJ, Barrett P. A revised version of the psychoticism scale. Pers Individ Dif 1985;6:21-9. 6. Furneaux WD, Gibson HB. A children's personality inventory designed to measure neuroticism and extraversion. Br J Educ Psychol 1961;31:204-7. 7. Gibson HB. A lie scale for the junior Maudsley personality inventory. Br J Educ Psychol 1964;34:120-4. 8. Gibson HB. Teachers' ratings of schoolboys' behaviour related to patterns of scores on the new junior Maudsley inventory. Br J Educ Psychol 1967;37:347-56. 9. Corulla WJ. A revised version of the psychoticism scale for children. Pers Individ Dif 1990;11:65-76. 10. Francis LJ. 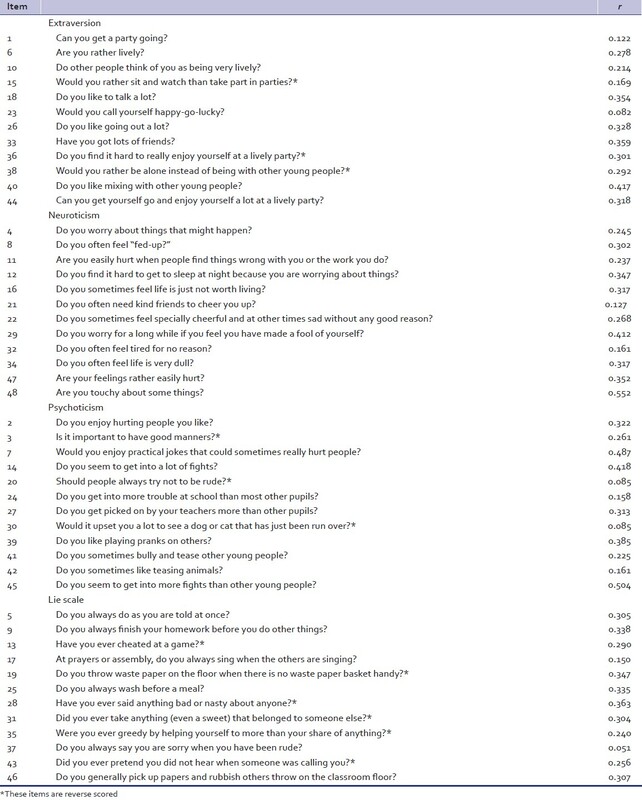 The development of an abbreviated form of the revised junior Eysenck personality questionnaire (JEPQR-A) among 13-15 year olds. Pers Individ Dif 1996;21:835-44. 11. Francis LJ, Brown LB, Philipchalk R. The development of an abbreviated form of the revised Eysenck personality questionnaire (EPQR-A): Its use among students in England, Canada, the U.S.A. and Australia. Pers Individ Dif 1992;13:443-9. 12. Francis LJ, Lewis CA, Ziebertz HG. The short-form revised Eysenck personality questionnaire (EPQR-S): A German edition. Soc Behav Pers 2006;34:197-204. 13. Tiwari T, Singh AL, Singh IL. The short-form revised Eysenck personality questionnaire: A Hindi edition (EPQRS-H). Ind Psychiatry J 2009;18:27-31. 14. Kline P. The Handbook of Psychological Testing. London: Routledge; 1993.